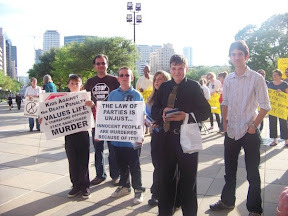 Kids Against the Death Penalty has won the 2009 Youth Abolitionists of the Year award given by Students Against the Death Penalty and Texas Students Against the Death Penalty. The award was announced and presented to KADP at the Texas Capitol on March 24 by Hooman Hedayati, president of Students Against the Death Penalty and Jason Kyriakides, board member of Texas Students Against the Death Penalty. The award recognizes the hundreds of hours of activism performed by Kids Against the Death Penalty in the last year educating the public about the injustice of the death penalty. The hard work and passionate commitment of members of Kids Against the Death Penalty has greatly benefited the national movement to abolish the death penalty. Several members of KADP are relatives of Jeff Wood, who is on Texas death row convicted under the Law of Parties even though he did not kill anyone. Scott Cobb of Texas Moratorium Network, one of the many people who nominated Kids Against the Death Penalty for the award said, "Martin Luther King, Jr wrote in a letter from a Birmingham Jail that 'injustice anywhere is a threat to justice everywhere'. That sense of injustice was what compelled Dr King to carry the gospel of freedom beyond his own home town. I have personally witnessed how Kids Against the Death Penalty have brought their message of justice beyond their own home town to cities throughout Texas. They have marched for miles along Texas streets holding anti-death penalty signs, through neighborhoods in Houston and down Congress Avenue in Austin to the State Capitol. They have stood vigil many times at the Texas Capitol when Texas has executed someone. They have visited the home of Texas Governor Rick Perry and pressed for justice. They lobbied members of the Texas Legislature on Lobby Day Against the Death Penalty March 24, 2009. Carissa Bywater of KADP testified to the Texas House Committee on Criminal Jurisprudence Subcommittee on Capital Punishment on March 19. (The video of Carissa's testimony is viewable here from the Texas House website, click forward to minute 57 and 50 seconds.) It is also now on YouTube. KADP has courageously spoken out on an issue in which relatively few other people in Texas, whether adults or children, have found the time or the courage to speak out about. By doing so, they are following in the footsteps of other children in America’s past who have stood up for human rights". "Children and teenagers played a significant role in the Civil Rights Movement. Barbara Johns was 16 in 1951 when she started a campaign for equal treatment at her school in Virginia. Her case became part of the landmark Brown v Board of Education decision by the U.S. Supreme Court that ruled that school segregation violated the Constitution of the United States. In 1963, more than a thousand children skipped their classes and marched in downtown Birmingham for equal schools. Many of them were arrested. Because of those kids’ actions during the civil rights movement, we live in a country today where candidates for president are not judged by the color of their skin but by the content of their platforms", said Cobb. "KADP has already inspired kids in other states to join the anti-death penalty movement. Because of KADP's hard work against the death penalty, both Texas and the U.S. have moved closer to the day when we live in a society where the state does not kill in order to teach the lesson that killing is wrong", said Hooman Hedayati. KADP members received commemorative medals and $100 to be used in their anti-death penalty work. Also Gislaine Williams of Rice for Peace (Rice University) and Ashley Kincaid (University of Indiana) each received a Certificate of Achievement by Students Against the Death Penalty. 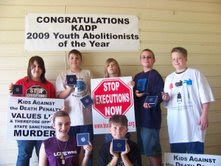 Members of KADP holding their awards for 2009 Youth Abolitionists of the Year. Below, members of KADP after receiving their award at the Texas capitol. Carissa Bywater of KADP Testfying at a Committee Hearing at the Texas Capitol on the Law of Parties.